As one of the early innovators in the compact system camera market, Olympus has enjoyed great success with its PEN range of Micro Four Thirds cameras. The retro designs of the PEN series have always appealed to those photographers hankering after the golden age of photography. The Olympus PEN E-P5 is no different – and now we have some initial sample images from a pre-production sample camera to show you. The original digital PEN camera, launched all the way back in 2008, was a bit of a game-changer. In terms of camera technology, five years is a long time, so expectations for the fourth generation of the top-of-the-line series are high. Olympus says it has pretty much gone back to the drawing board for this latest PEN incarnation, but there’s no denying that it takes its lead from both the Olympus PEN cameras of old, and the fantastic Olympus OM-D, which made its debut at the beginning of 2012. Inside the Olympus PEN E-P5 is the same 16 million pixel sensor and TruePic VI image sensor as in the Olympus OM-D, which should mean it is capable of the same impressive image quality. The design is very much inspired by the original analogue PEN, and particularly the black and silver incarnation. It’s enough to make anyone looking at the front of the camera do a double take. Of course, the technology inside the camera far surpasses that of its analogue forebears, and is also a significant jump from the previous Olympus PEN E-P3 camera. There’s also enough here to make it, in some respects, a step up from the Olympus OM-D itself. Aside from the same sensor and processor as the Olympus OM-D, the Olympus PEN E-P5 boasts an impressively fast maximum shutter speed of 1/8000 sec. That’s something that is currently offered by the likes of professional DSLRs, such as the Nikon D4 and Canon 5D Mark III, so to see it on a CSC priced at just £899 (around AU$1,368 / US$1,399) is quite something. That fast shutter speed means that not only should the camera be capable of capturing fast-moving subjects, it can also shoot at wide apertures in bright sunlight. Combine that with the new low sensitivity setting of ISO 100, and you’ve got a recipe for some really creative outdoor work. Olympus knows that it is a brand enjoyed by the creative photographer, so it’s no surprise to see a high number of digital filters, such as Cross Process and Dramatic Tone, making a reappearance on the latest model of the camera. There’s also the addition of Focus Peaking, a great tool for those who want to manually focus. Live Time and Live Bulb, the innovative way of shooting long exposures as introduced on the Olympus OM-D, is also found on the Olympus E-P5. This enables you to shoot very long exposures while watching the scene build up on the screen. It takes the guesswork out of this kind of photography, since you can see exactly when to stop the shutter. Olympus has now included a histogram view while using this mode to further assist the user. Another feature brought across from the Olympus OM-D is the 5-axis image stabilisation system. Compensating for pitch, rolling, yaw and horizontal and vertical movement, the results of this stabilisation can now be seen in Live View thanks to improvements in battery technology. We’ll be especially keen to put this particular feature to the test when a full Olympus PEN E-P5 sample comes in for review. Shooting at up to 9fps is available, but again this has been improved from the Olympus OM-D as this 9fps also includes autofocusing. Add in tracking and the rate is a still pretty impressive 5fps. This is another feature we’ll be keen to put through its paces. Improving the speed of the camera is something Olympus has seemingly worked very hard on. The new Olympus PEN E-P5 boasts a switch-on time of just 0.5 seconds, something that is matched only by the Fuji X-E1 when in its fast switch-on mode. We’ll be interested to see how short the shot-to-shot and processing times are, though with the TruePic VI processor onboard, it’s likely to be very fast. Olympus admits it has been late to the Wi-Fi party, but the PEN E-P5 is now fully equipped with this built in. The company claims being late has enabled it to study and improve upon the competitor’s offerings. One such feature is the ability to scan a QR code to connect the camera, rather than having the hassle of entering passwords. While the Olympus PEN E-P3 had a fixed touchscreen, the Olympus PEN E-P5 has a tilting, capacitive device. It’s the same 3-inch device as found on the Olympus OM-D, so we expect a very responsive and easy to use design. The touchscreen enables the autofocus point to be altered, or the shutter itself fired. Olympus has used a very similar handling design to the previous incarnation of the camera, but with some very noticeable and welcome improvements on the Olympus PEN E-P5. The chassis is very similar to its predecessor, featuring a fairly chunky grip, which is particularly useful when shooting one-handed. A rubberised thumb rest sits at the back of the camera to give a bit of extra purchase too. Unlike the Olympus PEN E-P3, the Olympus PEN E-P5 uses a switch to turn it on, rather than a button. This might seem like a trivial point, but it enables quicker start-up times. It has been recessed slightly into the body of the camera to prevent accidentally switching it on while in a bag or pocket. Like its predecessor, it uses a capacitive touchscreen, which can be used to set the autofocus point or fire the shutter release. One of the most noticeable improvements is the now tilting screen. It’s useful for angling away from any disturbing glare or reflections that might be present – although it didn’t seem to suffer too badly when we used it. It sits remarkably flush against the back of the camera, so much so that you might not even realise it’s a tilting device at all. While an articulating screen would be more useful for portrait format shots, it would undoubtedly have added to the bulk of the camera. At the top of the camera is a mode dial enabling quick transitions between the various modes on offer, such as fully automatic, semi-automatic (aperture or shutter priority) and manual modes. There’s also a space here for art modes, scene modes and – new to the PEN range – Photo Story mode. Also on top of the camera is a Function button, which can be customised to suit your particular requirements. The previous version on the Olympus PEN E-P3 required diving into the menu if you wanted to alter ISO or metering, but a new way of working has been introduced onto the Olympus PEN E-P5. A small switch around the movie record button marked with positions 1 and 2 enables you to alter the function of the two dials at the back and front of the camera. Position 1 controls aperture/shutter speed and exposure compensation (depending on the mode you’re shooting in), while flipping to Position 2 changes the modes to ISO and white balance. It’s a quick system that should really speed up the basic operation of the camera. For accessing other commonly used settings, a sort of quick menu can be found by pressing the OK button in the centre of the four-way navigational pad. If you need to delve further to change more complicated settings, you can do this via the main menu. As with other PEN cameras, it can be a little disjointed to use when you’re not used to it. It is of course hard to give any concrete opinions about the performance of a camera before we’ve had a chance to use a full version of it, but we have extremely high hopes for the Olympus PEN E-P5. The Olympus PEN E-P3 was an extremely capable camera in its own right, but putting the proven excellent Olympus OM-D sensor inside the new, even-more-retro styled body is very likely to be a winning combination – dare we say it, even better than the OM-D itself. 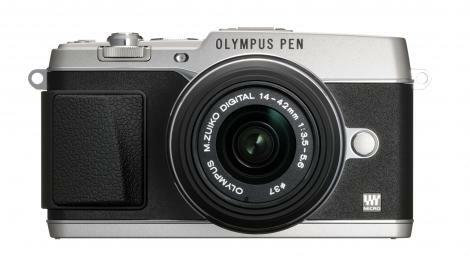 We’ve already seen how that incredible sensor can be used to good effect in both the Olympus PEN E-PL5 and the Olympus PEN E-PM2, so to see it in the top of the line PEN CSC is very welcome. Olympus promises that the 5-axis image stabilisation system has also been improved, so we’ll be very keen to put that to the test when a full sample arrives. We’ll also be keen to put the 1/8000 second shutter speed through its paces in capturing very fast action. It’s incredibly rare for a camera at this price point to be capable of such a thing, so we’re hoping it proves to be a solid performer. The Olympus PEN E-P5 is a very exciting camera, and with 2013 being a comparatively quiet year for launches compared with 2012, we think it could possibly be an early contender for best camera of the year. We already know what the sensor is capable of, and with that stylish body for good measure, we think this could be a big seller. The only drawback at the moment could be the price, making this one of the most expensive compact system cameras on the market, putting it in the same league as high-end cameras such as the Sony NEX-7, Fujifilm X-E1 and even its own semi-sibling, the Olympus OM-D.
For existing PEN owners, even those with an Olympus PEN E-P3, this looks like it will be a significant enough step up to be worthy of consideration for upgrade, while Olympus OM-D owners might even consider switching allegiance if they’re not too bothered about the in-built viewfinder. Those who do care for viewfinders will find themselves either having to go without or shelling out for the external device, which while very good, is an expensive extra that might push the price up a little too high. With the excellent screen, though, it’d be worth trying to live without it. We’ll keep you updated as soon as we can about this very promising addition to the PEN series lineup. The following are some initial sample images taken with a pre-production sample of the Olympus PEN E-P5, not a final model, so we cannot show you the full resolution versions. These smaller resolution photos give you an idea of what the camera will be able to achieve. We look forward to testing the final version of the camera in our full review soon.